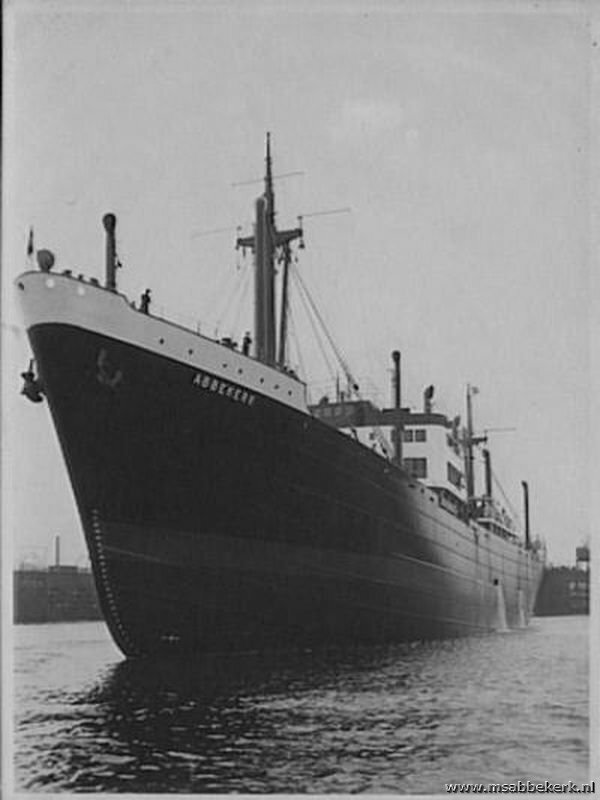 The “MS Abbekerk” was Dutch merchant vessel that had a short but eventful career in the first years of the Second World War. The ship was only 1,5 years old when it was heavily damaged in London during the Blitz in 1940 and it took half a year to be repaired. Being a fast ship for its time she mainly sailed independent or in fast military convoys. She supplied the British in Egypt in June 1941 and early 1942 she was in Malaya and the Dutch East Indies during the fall of Singapore and Java. There she took part in the evacuation of US and Australian troops and civilians from Tjilatjap to Fremantle. In August 1942 the Abbekerk was torpedoed and sunk 700 miles southwest of England by U-604. Inspired by my fathers memoirs, this website pictures the history of the ship and especially her wartime years. You will find lots of information on The Ship, The crew, The Routes she sailed and Pictures and Documents gathered in the past 15 years. But the probably most interesting part of the site are the stories of the men who sailed on her and a well documented week-by-week account of her last long voyage in 1941 and 1942. These can be found under The Stories and under Fragments. When you navigate the site most stories and information can be found in the main menu on top. The right menu can be used to also access the two main stories and wil show ‘what’s new’. The menu to the left of the article will give all information that can be found on this site about that particular voyage. So it will give different items, depending on the article you are reading. I would like to thank everybody who helped with information, documents, picture’s etc. Special thanks to mister Ben van Essen from Adelaide who translated all of my fathers memoirs into English. Thanks to him this website is in both Dutch and English: choose your language by clicking the little flag on the left. If you have any information about the Abbekerk or are in need of information of her, please contact me at peter@peterenhanneke.nl . If you find this site useful, interesting or have any other comments? Please leave a message below! Hi Peter One of my old friends born around 1935 told me yesterday, during a sporting event in Switzerland of all places, that he and his mother boarded the Abbekerk for that memorable trip from Singapore to Fremantle, leaving his father, a British Oficer, behind to fight the invaders. This prompted me to google the name of the ship and become familiar with Adriaan Kik’s fascinating memoirs Thank you, also on behalf of my friend Nigel. Thank you for your website. I have been reading a book about Qantas flying boats in WW2. The ship Abbekerk was mentioned so I looked for a bit more information. My father was in the 85 Anti tank regiment transported to Singapore in 1942. I noticed Walters post in 2013. My info of the 85 Anti tank was gained from the computer so Walter would probably have the same info. However it is good to know that someone has also researched the 85 Anti tank regiment. I would be willing to pass on any info I have. I found your father’s story quite by accident, searching for maps that showed where Oosthaven (NEI) was, since I am reading a book about the USS Stewart in the early days of the war. I’m excited to read your father’s story – thank you keeping this webpage going! Thank you for recording your father’s story. My own father spent most of the war, 1942-45, in Singapore as a PoW, and travelled on the WS12Z / DM1 convoys to get there, of which the Abbekerk formed part. It is only in the past year I have rediscovered some of his old papers and started my own research – your work has both encouraged me and been helpful, so thank you. My father was in the 85th Anti Tank regiment, which left the UK 12/13th November and arrived Singapore 13th January. I would greatly appreciate any information regarding which ship(s) this regiment travelled on for the journey, if you or any visitors to the site have any such knowledge. Once again, thank you for this labour of love, for preserving this history. Hi Peter. Fascinating story, and well presented. I am writing a guide to the history of the Thames in London, and would love to quote briefly your father’s experiences. Would I have your permission to do this? My parents sailed on the Maaskerk in 1943. My dad was in the Navy. I’m not sure why my mum was on a boat during the war! Thanks for these memoirs – they’ve given me an insight into what the trip must have been like for my parents. in the Konanda (Google it)and was an engineer on various Australian rust-buckets. I worked for ‘Australian Dredging’ (a subsidiary of Adrian Volker Dredging) for a few years and on an Australian Dredging contract in the port of Tjilatjap in 1970. Tjilatjap had been badly bombed by the Japanese and was derelict up to 1970 owing to the many wrecks and munitions laying on the river bed. The wrecks were dragged out of the river by cranes and torn apart by Javanese workers with hammer and chisel for scrap. Later, The Russians were also interested in Tjilatjap (Sukarno)for a submarine base, but that’s another story. I was re-travelling some of my own journeys when I chanced upon your fathers story. Peter: I just finished the newly published book on “Bull” Halsey exploits during WWII in the Pacific and I read it in tandum with the Japanese naval interpretation of their naval activities at Midway ( The Battle that Doomed Japan – Midway by Mitsuo Fuchida, former Captain & Masatake Okumiya, former Commander – published Ballantine Books, 1958). I was always fascinated by the fact that the Abbekerk made it to Australia and my father, a flight surgeon with the 13th Air Force in Lembang, Java said almost all of the convoy was destoyed by the Japanese Navy. I wanted to share with you a passage that I uncovered in the book which sheds some light on what happened to many of the ships leaving Java and how skillful the crew of the Abbekerk was, breaking away from the convoy and evading the Japanese Navy. 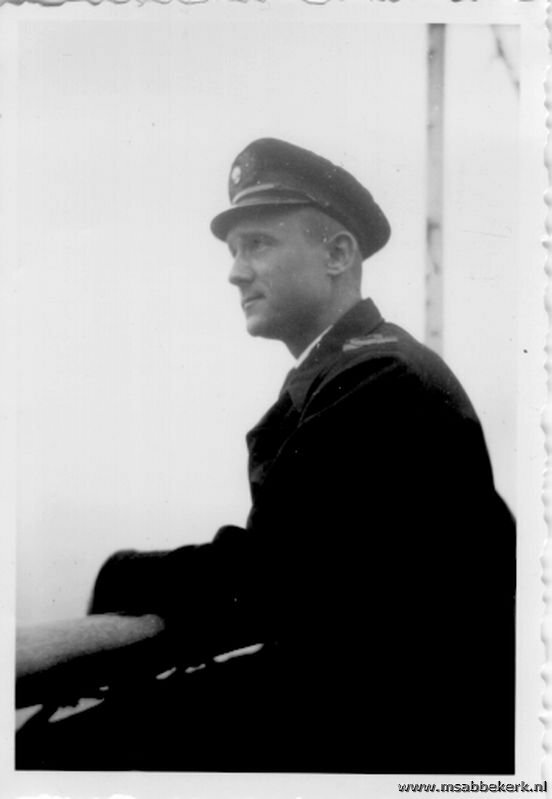 I have always considered my father’s escape from Java one of the most harrowing experiences in his war career even though he started the 801st Air Evacuation Squadron in New Caledonia, flying wounded out of Guadalcanal in the Solomons. I read your most interesting account of your father’s account of his day (feb 27 in the harbour at Tjilatjap). I was in the R.A.F.and boarded a dutch vessel Kota Gede at 5.30 a.m. on that day. We waited on deck all day and left the harbour at 8.00 p.m. I was browsing the Web the other day and came across the most interesting account of your Dad’s account of the voyage made by the MV Abbekerk from her sailing from Gourock on the Clyde until iis demise in the north Atlantic in August 1942. Iwas on board this ship at the time, being one of a group of four DEMS Gunners. (Later called Maritime AcAc Regiment). I could go on but rather than do so I would prefer you to contact me for further information if you have any questions to ask. Mijn vader heeft ook op de abbekerk gevaren en is ook gebombadeert en getorpadeert met de abbekerk. heeft daar wel over vertelt maar is in 1989 op 88 jarige leeftijd overleden ik kan nog wel wat verhalen herrinneren vindt het erg leuk om er iets over terug te vinden op het internet. I am currently typing up all of my father’s memoirs of the war and his time in Singapore. He passed away in 2001. Whilst piecing together some stories, I came across his memory of leaving Tjilatjap. My father’s troop had walked most of the way from Batavia to Tjilatjap – and were triumphant to see the sight of masses of troops on the main quayside. After reporting to the Army RTO, they were directed to the Abbekerk which they had to cross to board the ship tied next to it – the “Kota Gede”. They sailed on this ship for about 14 days to reach Columbo but before mainland was reached, they found out that the Abbekerk had been torpedoed on its way to Australia. This was one of my father’s very narrow escapes with his life. I hope you find this of interest and good luck with all your research. Hartelijk dank voor Uw bericht en website. Wij zijn momenteel bezig een klein boekje te schrijven over de Nederlandse bijdrage aan de strijd om Australie. We willen dit uitgeven bij de onthulling van een gedenkplaat hier in Adelaide voor al diegenen die een bijdrage in WW2 geleverd hebben. Ik neem aan dat U geen bezwaar heeft tegen het vermelden van enige feiten in uw website in het boekje. Being one of the very few Dutch frequenting Nihon Kaigun (www.combinedfleet.com) and j.aircraft.com, it was my pleasure and privilege to provide a substantial lot of the information for the ‘Shokaitei!’ (captured patrol boats) section, Dutch chapter, of the magnificient Nihon Kaigun website. Besides, I took a look on the NEI Forum after a too long absence there – and I saw your message about ABBEKERK. The next minute, so to say, the connection was made. Sailor pure and simple – his story is to-the-point and honest). It seems there are not many like him left today… this self-promoted clubman-seat Admiral does not count himself among them, for instance). Als Ã©Ã©n van de weinige Nederlanders, die Nihon Kaigun (www.combinedfleet.com) en j.aircraft.com frequenteren, was het mij een genoegen en een voorrecht een groot deel van de informatie te leveren voor het ‘Shokaitei!’ (veroverde patrouilleboten) hoofdstuk, Nederlands onderdeel, van de magnifieke Nihon Kaigun website. Ook nam ik, na veel te lange afwezigheid, weer eens een kijkje op het Nederlands-Indisch forum – en toen zag ik Uw bericht over de ABBEKERK website. Het volgende ogenblik was de link gelegd, zou men kunnen zeggen. Ik heb een grote waardering voor Uw website en de memoires van Uw vader (men herkent meteen de Zeeman, puur en eenvoudig – zijn verhaal is relevant en recht-door-zee). Het lijkt alsof er tegenwoordig niet velen meer zijn als hij… deze zelf-benoemde leunstoel-Admiraal rekent zichzelf daar vooral niet toe). out of Java just ahead of the Japs.